When the days are bright and the air is thick with humidity, ice cream is a great motivator. 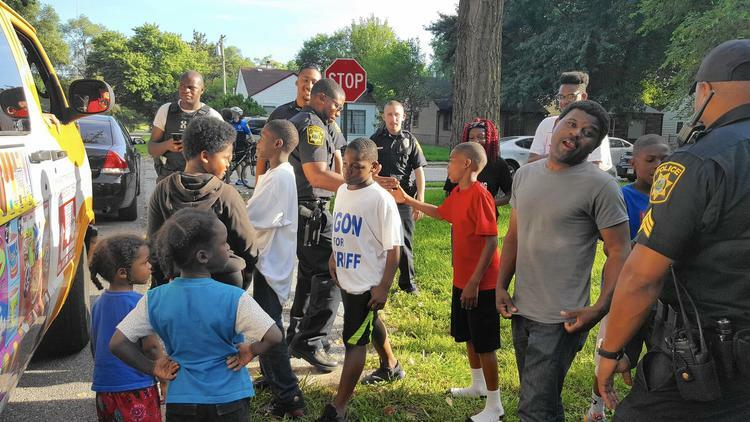 Over on 36th Avenue and Tennessee Street in Gary's Glen Park section Monday evening, kids flocked to an ice cream truck like, well, kids flocking to an ice cream truck during the dog days of summer. This particular ice cream truck, however, had a special detail: officers from the Indiana University Police Department, who'd rented the truck in order to give the kids in their patrol area a special treat. Not to be one to miss out, one boy came running out of the house still holding his video-game controller. "Look, he couldn't even put down his game," Officer Monte Davis said as he and the crowd laughed. Renting the truck is the latest effort the campus department has undertaken to reach out to the community. One officer, Sean Liesenfelt, canvassed the area around the university on his bike to find where the kids were hanging out. He would then radio their whereabouts to Police Chief Wayne James and other officers, who escorted the truck to them. The men then doled out ice cream to whoever wanted some. James said Monday was the first time officers had incorporated ice cream into their community policing efforts. It's an idea he and his department hope others will adopt. "We've done other initiatives, like Coffee with a Cop and the Citizens Academy, and we thought this would be a good way to build better relationships with the people we serve," James said. "The guys wanted to do this, and they gave their own money as well as our collecting donations from the community." The area has special meaning to James, too, as well as Davis and Detective Cliff Caldwell. They all grew up in Glen Park. "The city has changed a lot since we were growing up in the '90s, and we have an investment here," Davis said. "We want the kids to see that we enforce the laws, but that we're here to protect them too. "In spite of all the negative press that's out there these days, we're not trying to change an image. We want to reinforce that we're always here to protect people first." Vincent Wright, a parent hanging outside with his daughter, Vanity, 12, and her friends when the ice cream came around, was especially grateful for the effort. Vanity happens to be terrified of policemen, Vincent Wright said. "I'm a security guard, and I tell her all the time they're here to help us, but I watch the news all the time, so maybe that's where she's seeing the bad," he said. "So this is a good thing for her." Another parent, Anthony Welles, chatted with Davis and James about living over on 36th Avenue. He, too, praised the department's effort. "As an officer, how're you going to know what people are doing if you're not here talking to them?" he said. James deemed the operation a success and plans to do it again, he said.